The Board of Investment of Sri Lanka conducted an interactive discussion where the Chief Guest was Chandra Das, High Commissioner of Singapore to Sri Lanka. The High Commissioner shared his first hand experience in the development of Singapore from Third World to First with leads in many development aspects, particularly in the attraction of Foreign Direct Investment. 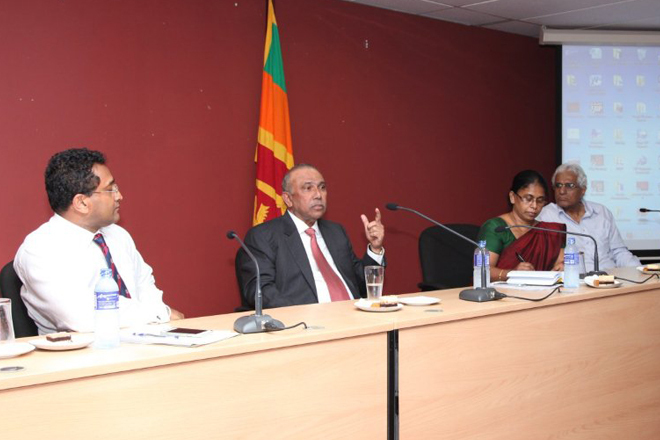 The audience consisted of senior officials of the Board of Investment of Sri Lanka and the Export Development Board. The High Commissioner described Singapore’s development since 1965 when the city state left the Malaysia Federation to become an independent country. From the onset Singapore sought to become a center of excellence in the area of attraction of investment by implementing policies to actively promote investments for job creation. This was achieved by exploiting the country’s excellent geographic location and connectivity. Singapore also set up a number of overseas offices in several key cities in the world where officers of the Singapore Economic Development Board (EDB) would promote Singapore for investments. The officers of the Singapore EDB were empowered to act independently, and a culture of educated risk taking was encouraged. He said that allowed officers to learn from their mistakes quickly. The High Commissioner who had worked nearly 10 years in the area of investment said that Sri Lanka needs to be very focused in order to attract investments. He opinioned that most investments to the country in the future will come from East Asia and particularly South East Asia. In the case of Singapore, Japan had emerged as the number one investor in the country. The High Commissioner focused on the importance of investing in education since it leads to the creation of a strong economic base which is a prerequisite for development. The Sri Lankan side spoke of the creation of two new agencies that would be responsible for accelerating the implementation of investment and also promoting exports.